Request air conditioning service, new installation, or maintenance right now! It’s a warm summer day in Atlanta and you go to turn on your air conditioner. What happened? Awaiting for that cold blast of air that doesn’t seem to be coming out? Air conditioning repairs don’t have to be a headache for you. We recommend getting on an air conditioner HVAC service plan with us to save money in the future on costly repairs. You never know when you’re going to be needing HVAC service. Don’t put off getting your air conditioner diagnosed correctly for what ails it. Call EcoMech and we will diagnose that noisy, non working A/C today! Your air conditioning system plays the head role when it comes to the comfort of you and your family’s home. Peak summer months in Atlanta bring lots of heat! You’ll be looking to your air conditioner to cool you off quick! Air conditioners break down, that’s a fact, but nobody knows the exact moment when they will stop working and leave you in hot uncomfortable temperatures. Air conditioning repair can look easy on online videos or “do it yourself” shows, but most of the people you see on those videos are air conditioning pros. Unless you have expert knowledge about your A/C system then we don’t recommend tinkering with it. It’s always best to hire the trained professionals of EcoMech Heating and Air for your air conditioner repair and servicing needs. EcoMech Heating and Air is certified and licensed to complete any air conditioning repair, service or maintenance needed in your home. 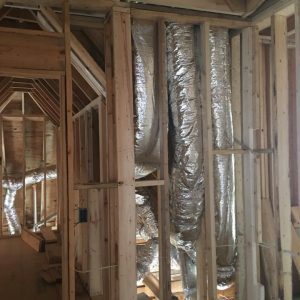 We only install the highest of a/c products and units with professional quality such as Goodman, Carrier, and Trane HVAC products, providing our customers the highest in service. We respect your busy lifestyle and your home, and strive to complete all jobs with as little intrusion as possible. Financing a home energy efficiency upgrade like a new HVAC unit can get expensive, especially depending on the size and age of your home. EcoMech Heating & Air offers our customers a variety of options with approved credit to make purchasing and installing an energy efficient heating or cooling unit easy and convenient. Learn more about those options here.